There is new and updated content for 17 communities. This release includes several states, counties, cities, and facility sites throughout Estonia, Canada, Germany, Kuwait, and the United States, as seen in this Story Map. 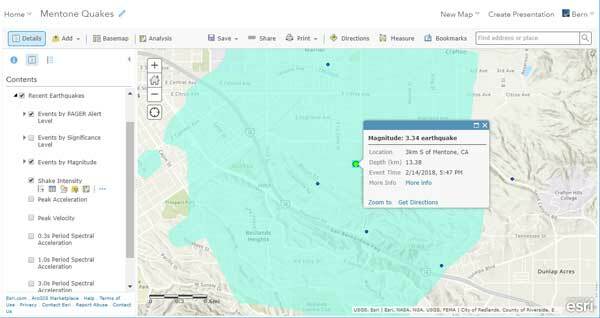 A recent post covered how to make an earthquake map quickly using ArcGIS Living Atlas of the World content. 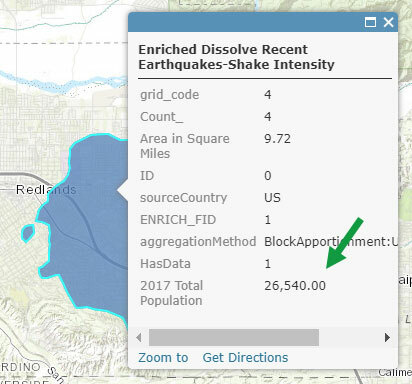 In Part II here, we’ll take our map a couple of steps further and use Living Atlas content plus geoenrichment and analysis tools to determine the total population impacted by a quake. In this case it was a minor quake, without any damage. Note that appropriate organization privileges are required to use analysis tools. In the previous post we left off with our map showing the shake intensity and earthquake events by magnitude. 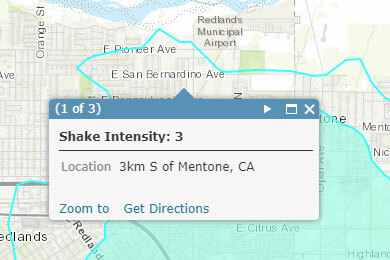 Shake intensity is one of the sublayers in the Recent Earthquakes layer. Click the arrow or layer name to reveal all the sublayers. Opening the legend for the Shake Intensity sublayer, we can see that the intensity is displayed only if higher than III. And if we click our map we can see that areas of III or less intensity are present, but not shaded. 1. 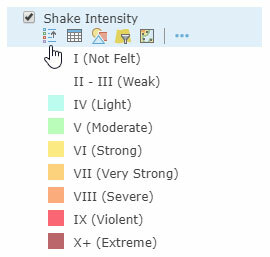 Filter the Shake Intensity layer to only include areas greater than 3 in intensity. 2. 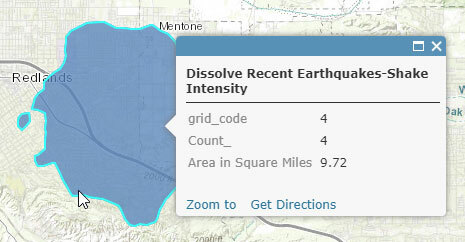 Dissolve the boundaries by intensity level, so we can determine the total population impacted by each level. 3. 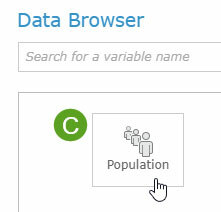 Enrich the polygon with population data. 4. Finalize the map, and display the results. The steps outlined above, are presented below in detail. Filter the Shake Intensity layer to include only polygons of greater than 3 in intensity. We had to do a little exploration, and discovered that intensity is stored numerically in the grid_code attribute. And construct the expression. In this case, filtering for all features where the grid_code is greater than 3. Click Apply Filter after completing the expression. 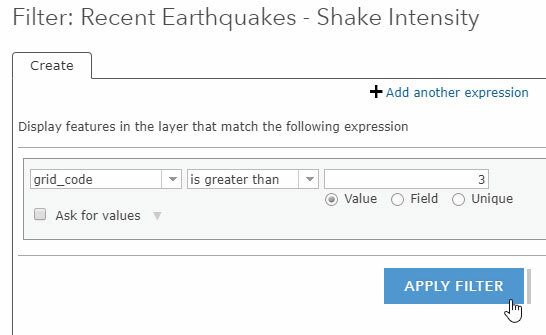 (A) Ensure the Shake Intensity sublayer is selected. (B) Select Areas with same field value as the dissolve method, and choose the grid_code attribute (since we’ve determined that is where the intensity value is stored). (C) Check the box to Use current map extent, since we want to limit our dissolve to just this one quake. We now have a single area (since nothing was over 4 in intensity for this quake). To determine the population within the area from Step 2. we can use the geoenrichment tools. Click Perform Analysis, choose Data Enrichment, then click Enrich Layer. (A) Ensure the result layer of Step 2 is the layer to enrich. 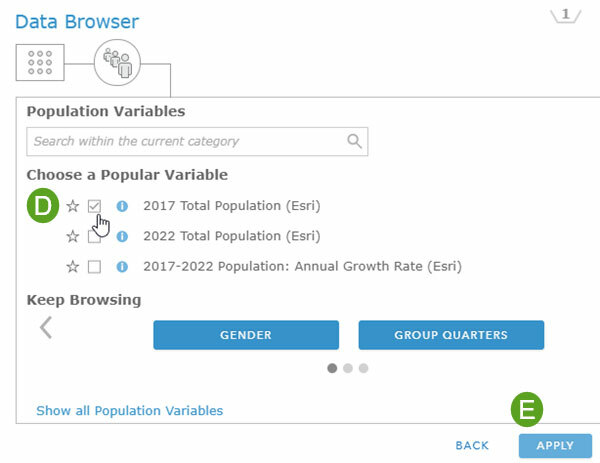 (D) Choose the 2017 total population variable. 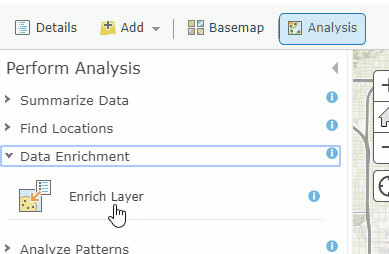 Back at the main Enrich Layer dialog, ensure that you’ve checked Use current map extent, then Run Analysis. A new layer will be created that will include the population count. For our final step, all we need to do is finalize our map by removing unneeded layers and renaming the ones we want to keep, and configure the layer pop-up (shown below) to provide a more meaningful display of the results. There I was… Sitting at the kitchen counter, with my laptop open and catching up on a few loose threads left over from a busy day. Then suddenly, bam! And then another, but more forceful, BAM! As if a large hand had slapped the side of the house. I knew immediately what it was, a familiar feeling living in Southern California. It was an earthquake. I knew it was close, but where? 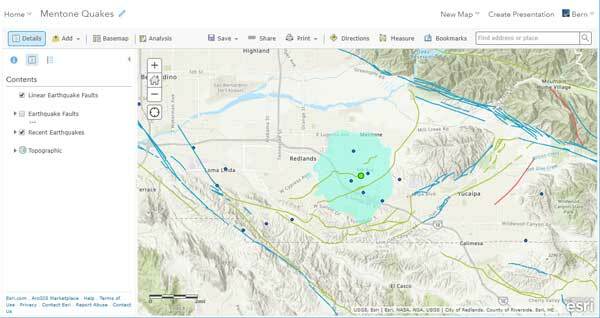 I signed in to my ArcGIS account, opened the Map Viewer, and browsed the Living Atlas to search for earthquake feeds and layers to make a map to learn where the quake occurred. Typing in “earthquake” I quickly found the Living Atlas layers I wanted – Recent Earthquakes, Earthquake Faults, and Linear Earthquake Faults. 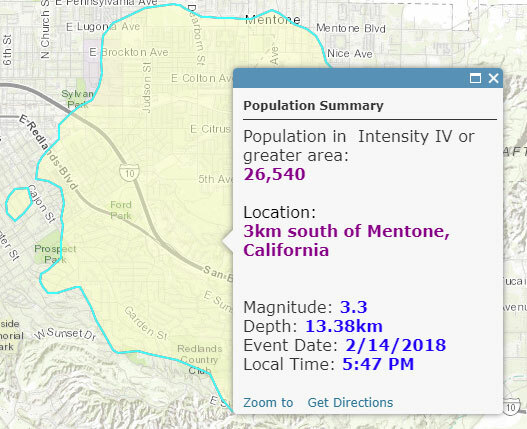 Turning on Recent Quakes, I quickly discovered where the quake happened, in the nearby community of Mentone, California. The colored area is the PAGER alert polygon automatically generated when significant seismic events occur. 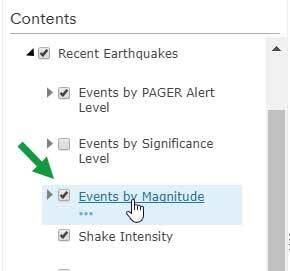 PAGER stands for the Prompt Assessment of Global Earthquakes for Response. It is an automated system that takes in seismic data from remote sensors in order to rapidly estimate earthquake shaking and the scope and impact of earthquakes around the world. 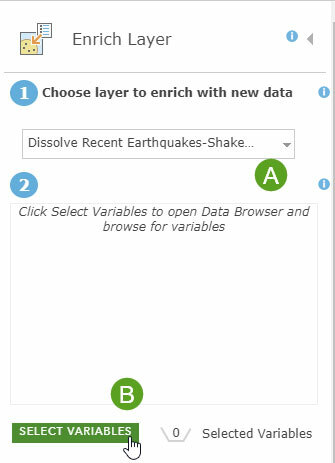 Next, I opened the Recent Earthquakes layer and turned on the Events by Magnitude sublayer. 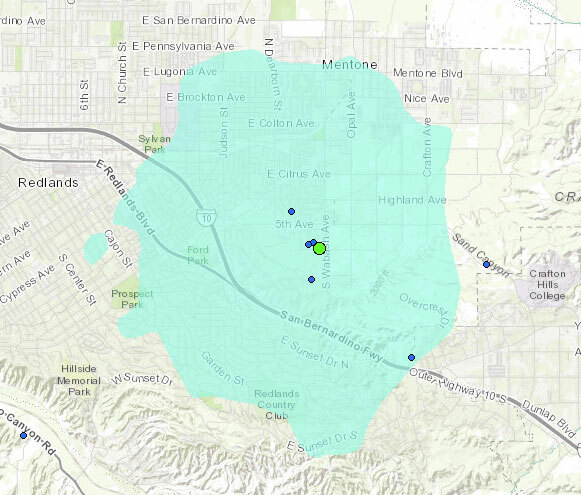 My map now showed the cluster of earthquakes, the two largest of which I felt. The largest one was Magnitude 3.34 – just a little nudge, but close enough to be felt. I turned on the other layers to get some additional context about the nearby faults. 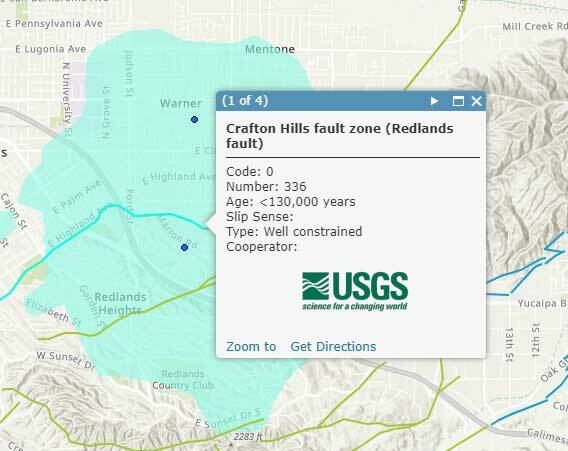 And discovered that this little cluster of temblors happened along the Redlands fault, in the Crafton Hills fault zone. In just about a minute, I had my completed map of the quake, and knew a lot more than I did moments ago, thanks to the Living Atlas. For more information see the ArcGIS Living Atlas of the World website. The ArcGIS Living Atlas of the World has a new set of maps that make US Census data really shine (pun intended). 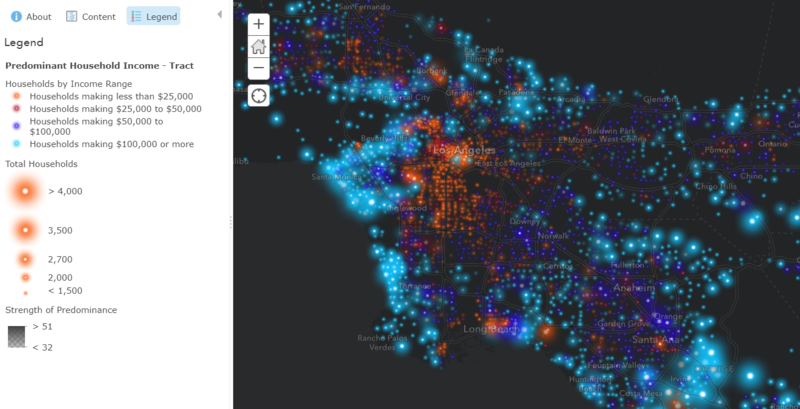 Using the new Firefly Cartography style, these maps highlight distinct patterns about how the population and households are distributed throughout the United States. They cover a range of topicssuch as income, educational attainment, language spoken at home, and transportation to work. 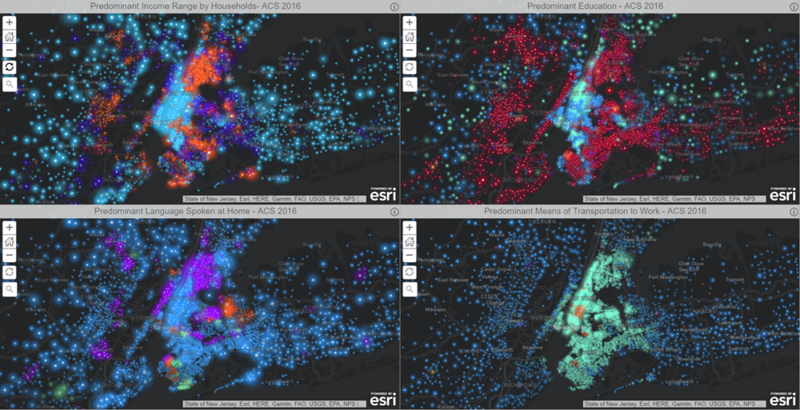 These maps use the 2012-2016 American Community Survey (ACS) data offered by the US Census, which was released in December 2017. Each web map contains the data for both counties and census tracts to help tell a regional and local story about the data. At a nationwide scale, you’ll see the county pattern, and as you zoom in, the census tracts will appear. The maps use point centroids instead of polygons to avoid drawing extra attention to larger counties and tracts simply because they take up a large amount of area. To learn more about these maps, let’s explore the Predominant Income map. This map groups households into four income ranges and shows the group with the highest count of households. 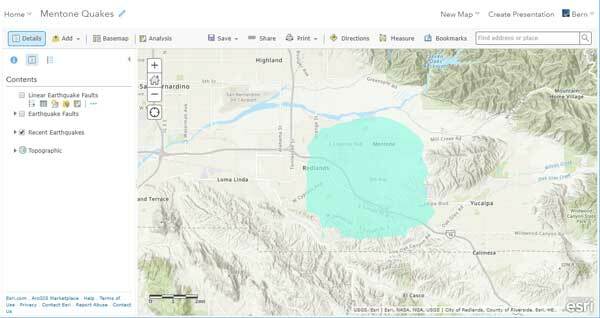 This mapping technique is known as predominance, and can easily be done in ArcGIS Online within the Change Style settings. This technique highlights the predominant income range, and the symbol’s brightness depends on how predominant the range is over the other categories (strength of predominance). This map helps us understand the distribution of income, and has interesting patterns of wealth and poverty, especially in large cities like New York City, Los Angeles, and Chicago. The size of each point represents the quantity of households in that area. Within each of these firefly demographic maps, the size of the symbols represent the population sampled by the ACS. So in the Predominant Education map, the size of the symbols shows the count of population aged 25+ because the map represents the predominant education level of the population 25 and up. 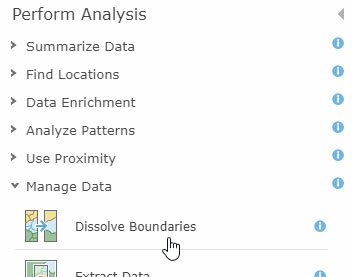 To learn more about an area, click on the map to reveal a popup which showcases the overall pattern of the data. In the income map, the popup tells you the predominant income range and also shows you a chart of the categories being compared. There are many ways these maps can be used. The only limit is your imagination! 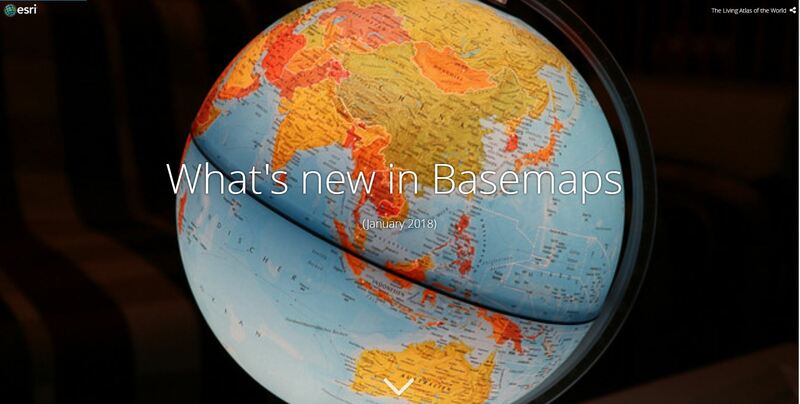 The web maps are ready to use, and can be added directly into your mapping applications. 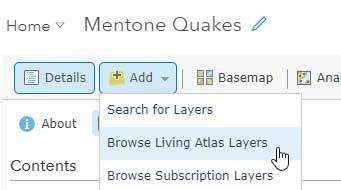 The layers are also included in the Living Atlas as hosted feature layers so that they can be added into your own maps and analysis. 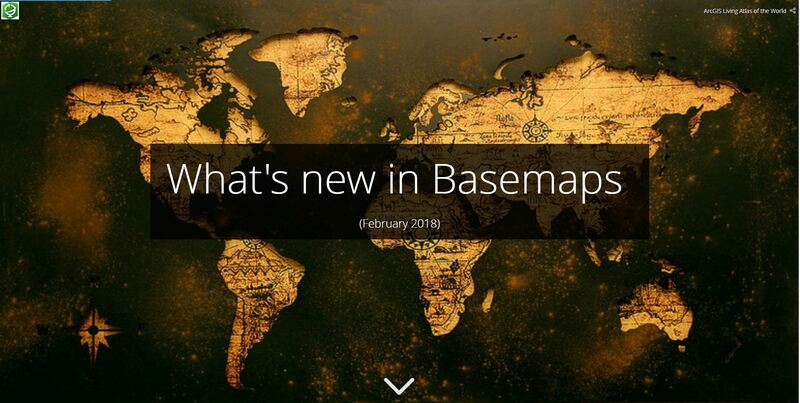 You can even make new maps using the data by changing the map style and saving the changes as your own web map. Within each layer, there are other attributes related to the map topic. Since this data comes from the ACS, the margins of error are also included in the data.